Beaked Hazelnut is a multi-stemmed, deciduous shrub native to North America. It features smooth, grey bark and edible nuts. Beaked Hazelnut prefers a rich sandy-clay loam but will grow on poorer sites, and can be used as an understory shrub. 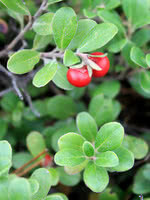 Bearberry is a dwarf shrub known for its creamy pink flowers and red edible fruits. It is great as a filler in gardens and flowerbeds in place of invasive ground cover plants, like English Ivy. Bearberry will attract hummingbirds, butterflies and bees to your property.